Overlooking central campus from atop Barnes Hall. Download the live still image, updated every 30 seconds. 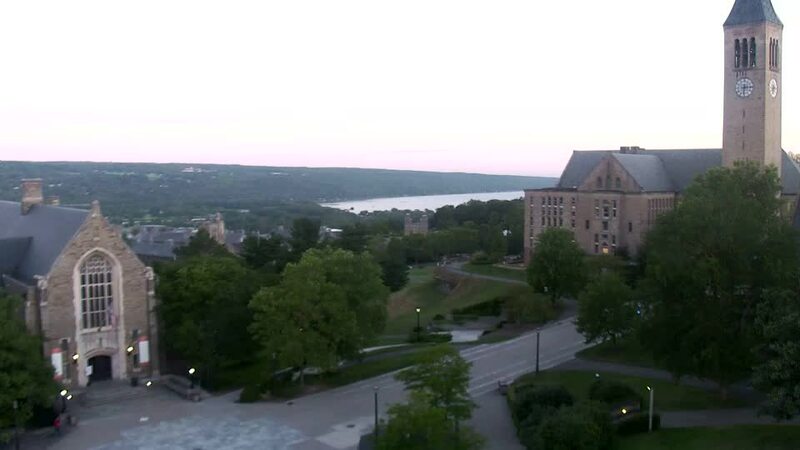 Cornellians may not know every word of the alma mater's six verses, but they certainly know the tune, thanks to the 21 bells in McGraw Tower, which sits with Uris Library at the top of Libe Slope. Student chimesmasters climb the 161 stairs to the top of the tower where they play three concerts daily. Located at the crossroads of campus, Ho Plaza serves as Cornell's town square. Here, between Willard Straight Hall and the Cornell Store, students chalk announcements of upcoming events and make their voices heard, hoisting signs and encouraging passers-by to sign petitions. Day or night you'll find students on their way to and from class or the library.